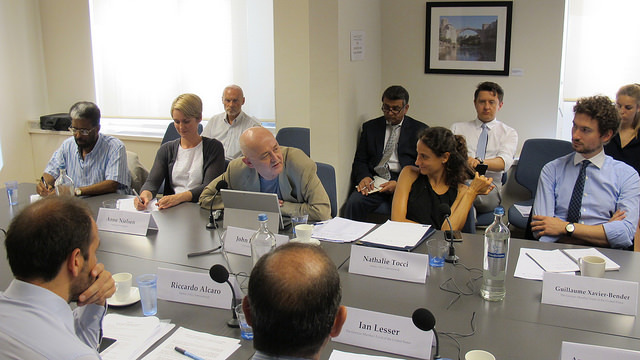 On 2 July 2015, the German Marshall Fund of the United States (GMF), in cooperation with the Istituto Affari Internazionali (IAI), hosted the final dissemination conference of the Transworld Project in Brussels. The dissemination was divided in two sequences: 1) a public event composed of a morning and lunch session; 2) closed door briefings at the European Parliament (EP) and at the European External Action Service (EEAS). The public event, entitled “The Role of the Transatlantic Partnership in the Future of Global Governance” took place from 10:00-14:00 in the GMF’s Brussels Office. It was attended by about 60 participants from EU institutions, country representations, business, academia and think tanks. 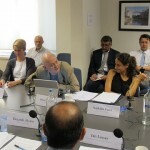 The first, on-the-record, session addressed “EU-U.S. Cooperation in Shaping Global Governance” and was followed by a second session held under Chatham House rules on “the EU, the U.S. and the BRICS: The Challenge of Governance”. Three briefings were organised for Transworld experts at the European Parliament where they met with staffers from the secretariats of various committees, delegations and political group advisors. A round-table was organised at the EEAS with Riccardo Alcaro and Ettore Greco, Director of IAI, on “Short and Long-Term Implications for the EU of the Current Crisis With Russia.” It was attended by a group of 15 select participants from the Russia, transatlantic and civil-military units at the EEAS.